Few of us like uncertainty. Not knowing what we should do in a situation, being unable to predict the outcome of a choice we make, having to wait upon someone else’s decision which will impact our lives. My middle child has to decide by tomorrow between two colleges and whether or not to take a gap year. She continues to seek my advice, wanting in many ways that she did not have to choose herself. Unfortunately for her, she has a mother who believes it really does need to be her decision. In our conversations recently, she has talked about her friends’ parents, all of whom are handling this life stage of their children differently. Some parents have issued ultimatums about where their children will go. Others have given no help to the process at all. I like to think that I have been in the middle and not at either extreme. My husband and I have shared our thoughts about the strengths and weaknesses of all her choices, but have also given our daughter the freedom to think about who she is and what she thinks would be the better choices. Being able to take the middle ground, though, is not always easy. Extremism is a simpler path in many ways. You do not need to work as hard to consider all the options and everyone else’s thoughts and feelings. I recently sat in on a meeting where a parent coordinating a school-wide breakfast told me that if a parent had a child with food allergies, that it was up to the parent to provide food for their child. On the one hand, I understood the parent’s position. Parents who don’t have children with food allergies are not going to think about the need for providing food which is not traditionally made. On the other hand, if an event is being put on for all students by the school, then shouldn’t the folks in charge be considering all students’ needs? In this case, the middle ground is that I will be providing food for the students with allergies because I am on the committee and understand such needs. 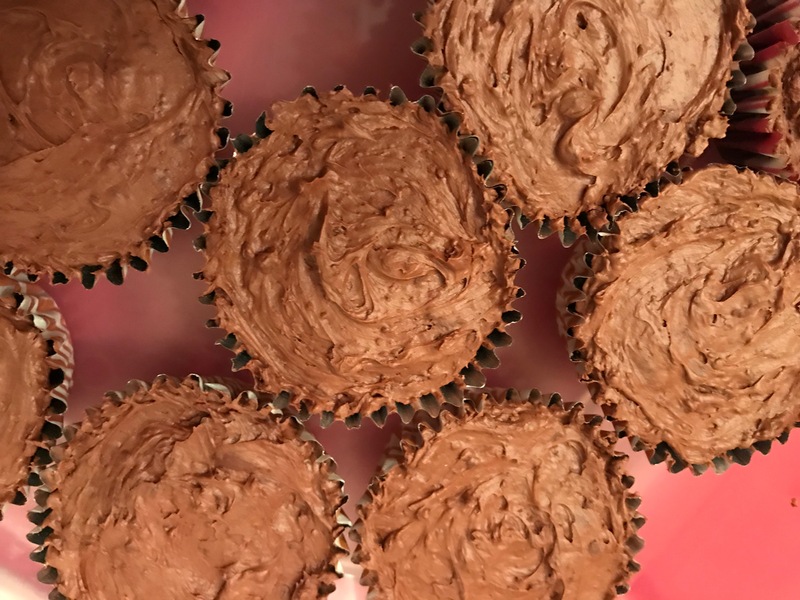 This is actually a middle ground I have been in for many years for other events, and recently I made cupcakes for a staff appreciation event which are free of the major allergens and which I thought I’d share for this post. The recipe is below. Enjoy! Put the chocolate chips into a large microwave safe bowl with the vegan butter and heat for one minute. Stir. Then continue to heat for 15 seconds at a time, as needed, just until stirring melts all the chips. Put the mixture into the freezer for 10 to 30 minutes, depending on the type of bowl you opted to use. The more shallow the bowl, the faster the mixture will begin to freeze. You just want the mixture to freeze around the edges and the center to still be soft. Mix the partially frozen mixture with a Kitchen Aid or hand blender, scraping down occasionally, until light and fluffy. Set aside until needed for frosting. Just before using re-blend to make it light and fluffy again. 1. Preheat the oven to 350 degrees. Line 30 muffin cups with liners and set aside. 2. Mix together the flour, baking soda, salt, and unsweetened cocoa powder. Add the chocolate chips and cranberries. 3. Blend together the Agave, oil, vanilla, orange juice, and water. 4. Add the dry ingredients to the wet with the vinegar, and mix quickly just until the dry ingredients are moistened. 5. Pour into the prepared muffin tins, and bake for 15-20 minutes until the cupcakes are puffed and firm to the touch and a toothpick inserted in the center comes out clean. 6. Cool the cupcakes on wire cooling racks; then frost and enjoy!